I’ve just released a new minor version for Ribbon JS introducing a couple of new features, properties and methods. The new version is fully backwards compatible with the previous versions of the control (4.0.0 and above), so it is safe to upgrade. The HTML5 Web Component for Ribbon JS has also been updated to support the latest additions. 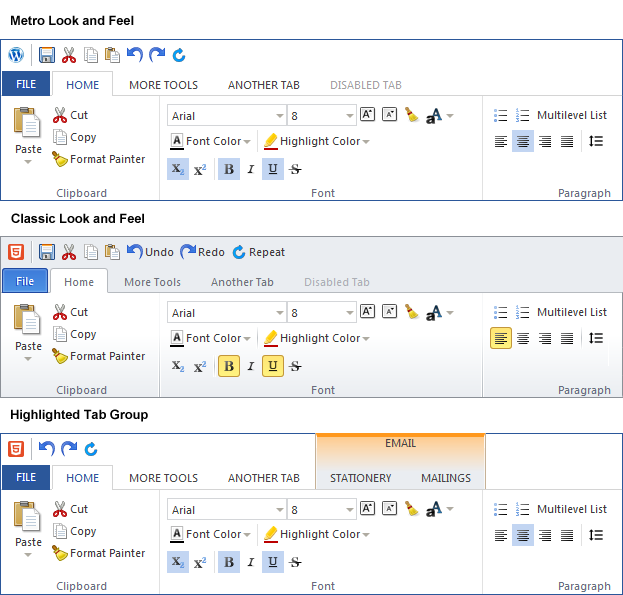 New highlightTabsGroup method, allowing contextual tab grouping. The method supports custom colors and labels. New unhighlightTabsGroup method, which removes a tab group, set via the highlightTabsGroup method. New enableFlatStyles method, allowing to set flat (Metro) look and feel to the ribbon. New disableFlatStyles method, setting back the classic (pre Office 2013) styles to the ribbon. New appIconUrl property, set in the constructor of a ribbon, allowing custom top left application icon. The property is optional, and the default icon is the HTML5 badge. New flat property (optional, Boolean), set in the constructor of a ribbon. If set to true applies flat (Metro) look and feel to the ribbon. Its default value is false.